← AND Even MORE Photos! Two of the HOSCAP Borneo team – John and Seth – work with researchers from the Leibniz Institute, Berlin , to monitor wildlife in Deramakot Forest Reserve, Sabah. This is the first logging concession in Malaysia to be certified as sustainably managed by the international standard Forest Stewardship Council (FSC). The way things are done in Deramakot are VERY different from the way things are done in Sarawak logging concessions! Sarawak and Sarawakians have a LONG way to go before we can claim to have any idea how to manage our forests sustainably. Merry Christmas and happy holidays everyone! 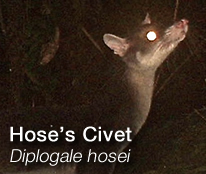 This entry was posted in HOSCAP Borneo, Photographs, Research, Updates and tagged Borneo, conservation, Conservation Project, HOSCAP Borneo, Hose's Civet and Small Carnivore Project, John Mathai, Sabah. Bookmark the permalink.